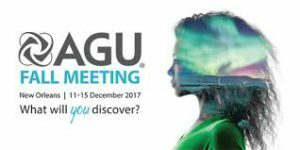 We were present at the 2017 AGU Fall Meeting. Icy environments may have been common on the early Earth due to the faint young sun. Previous studies have proposed that the formation of large icy bodies in the early ocean could concentrate the building blocks of life in eutectic fluids and therefore facilitate the polymerization of monomers. This hypothesis is based on the untested assumption that organic molecules are virtually incompatible in ice Ih. In this study, we conducted freezing experiments to explore the partitioning behavior of selected amino acids (glycine, L-alanine, L-proline, and L-phenylalanine) between ice Ih and aqueous solutions analogous to seawater. We let ice crystals grow slowly from a few seeds in equilibrium with the solution and used Raman spectroscopy to analyze in situ the relative concentrations of amino acids in the ice and aqueous solution. During freezing, there was no precipitation of amino acid crystals, indicating that the concentrations in solution never reached their solubility limit, even when the droplet was mostly frozen. Analyses of the Raman spectra of ice and eutectic solution showed that considerable amounts of amino acids existed in the ice phase with partition coefficients ranging between 0.2 and 0.5. This study also explored the partitioning of amino acids between other phases of ice (ice VI and ice VII) and solutions at high pressures and observed similar results. These observations implied little incompatibility of amino acids in ice during the freezing of the solutions, rendering the hypothesis of a cold origin of life unwarranted. However, incorporation into ice could significantly improve the efficiency of extraterrestrial transport of small organics. Therefore, this study supports the hypothesis of extraterrestrial delivery of organic molecules in the icy comets and asteroids to the primitive Earth as suggested by an increasing number of independent observations.